Aviation historians commonly consider the Fiat G.55 Centauro the best single seat fighter produced for the Italian air force during the Second World War. The airplane clearly demonstrated parity with, if not superiority, to the Bf-109G, the Fw-190A, the P-51D and the Spitfire IX, demonstrating that the Italian aviation industry was capable of designing and producing a world-class fighter. Unfortunately for Italy (and fortunately for the Allies), it came just too late to have a major effect on the conduct of the war. The Fiat G.55 was Fiat’s answer to a 1942 requirement placed by the Regia Aeronautica for a fighter that would be designed from the outset to take advantage of the German Daimler-Benz engine. The previous fighters - the Macchi C.202 and the Reggiane Re.2001 - had been developments of earlier designs to utilize the Daimler-Benz DB601. Named Centauro the G.55 was a development of the G.50 Freccia, though it owed little more than a general layout commonality to that fighter. Fiat was fortunate that they had already been working on an advanced design when the Regia Aeronautica decided to produce a “third generation” fighter. The previous design had been planned to utilize a domestic high-performance engine which did not come to fruition. Modification of the advanced design to utilize the German DB605 engine was relatively easy, and it put Fiat ahead of its competitors - Reggiane with their Re.2005 and Macchi with their C.205N and their “stopgap” C.205V, with the Fiat prototype taking flight on April 30, 1942, well before the competition. By May 1943, the Serie I had flown with the central MG151, two 12.7mm machine guns in the upper forward fuselage, and an MG151 in each wing. 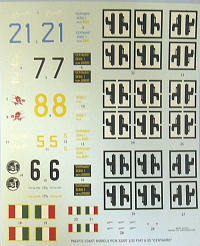 Italian pilots were elated when the Serie I proved itself more maneuverable than either the Bf-109G or the Fw-190A in tests that summer, with the Italian fighter being able to accelerate away from both German fighters in a dive and only being inferior to the Focke-Wulf as regarded roll rate. By the time production began for the Serie I in the fall of 1043, Italy had surrendered. The pilots of the Serie O aircraft were all from Northern Italy, an d since Fiat was based in Turin in the Republica Sociale Italiana declared by Mussolini following his rescue by the Germans, it was logical that the airplane would now become the main equipment of the Aviazione Della R.S.I., the new Fascist Air Force, and several thousand G.55s were ordered. Unfortunately, shortages of engines began to develop quickly. The license-built Italian engine of the DB605 was as good as the license-built Italian version of the DB601 (not very), and the Italians were forced again to depend on German production for their engines, which put them at the end of the priority list after the DB605s were produced for the Luftwaffe. In the end, due to shortages and non-delivery of the DB 605A-1 engines, only 105 FIAT G55's were produced. Force majeure required that the Italian units re-equip with the Bf-109G, though some unofficial production of the G.55 continued until the end of the war. Following the end of the war, production of the G.55 resumed for foreign export with G.55A single-seaters and G.55B two-seat trainers built. The G.55A was armed with either 2 12.7mm machine guns or 2 20mm canon in the wing, plus the 2 12.7mm machine guns in the cowling. The postwar Italian Aor Force purchased 10 two-seaters and 9 fighters, while 30 - 15 G.55As and 15 G.55Bs - were sold to Argentina. Argentina returned 17 G.55As that were then sold to Egypt in 1948, though they did not take part in hostilities. The final version of the G.55 was the G.59, which was redesigned to use a Merlin engine. The Italian Air Force bought 10 single-seater and 10 two seater G.59s to use as fighter trainers in 1952-52, thus making the Fiat design the last piston-engine Italian fighter in production. The kit is typical Sword: shiny injection plastic, a bit thick, with panel lines that are slightly heavy but will look OK under the proverbial coat of paint from my experience. 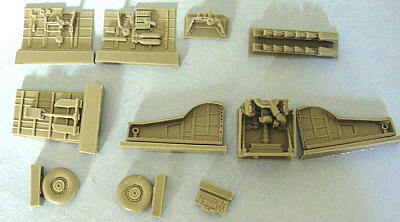 The cockpit and wheel wells and engine are done with very crisp resin parts that are so well-done there are very few parts, yet the result will look highly detailed. 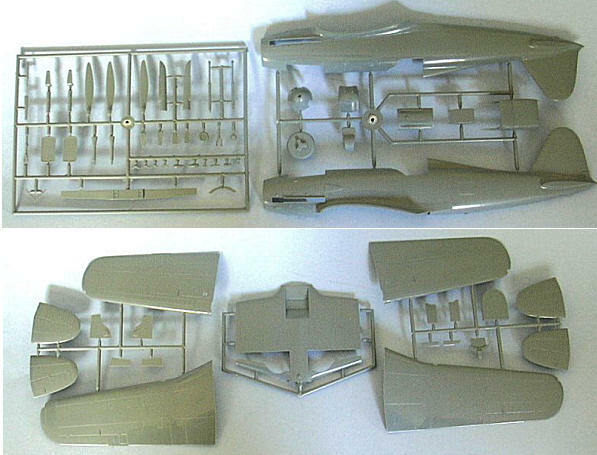 Test-fitting the kit reveals that the fit of the plastic parts is superior to that of the Re.2005 and somewhat better than the Spitfire IX, both of which are very good examples of limited-run kits. The two part canopy and windscreen are thick, but very clear. From early work on the kit, this looks to be the best G.55 available in any scale, and should result in a very nice-looking model. 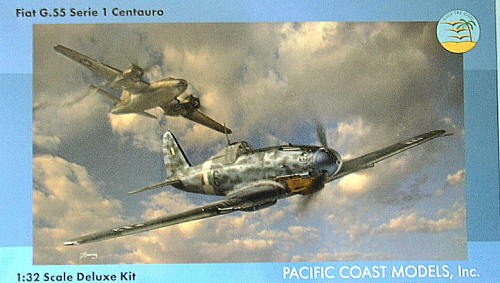 Thanks to Pacific Coast Models for the review kit.